If there's One DJ that you want at your Wedding Reception it has to THE DJ Hawaii's "Tony So" Well known for his ability to DJ and Emcee Weddings "Tony So" has been highly recommended by Top Wedding Professionals in Hawaii and the U.S. Mainland. Internationally know for his ability to unite different cultures to share the same dance floor and move to energy he produces from his ability to mix songs from the past to the present. His ability to mix all types of style of music makes it very easy to please Brides and Grooms who trust "Tony So" to make their Wedding Reception Simply THE BEST! Everything You Need for less Stress is "Tony So" Experienced, Professional and Exciting for Every Wedding Reception. 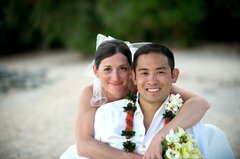 Learn more about THE DJ Hawaii featuring "Tony So"
Wedding DJ, Wedding Emcee, Wedding Book... Now! Tony was so great at our wedding reception. On time, and did an amazing job with the schedule and music. He always answered my emails and phone calls promptly and always offered help above and beyond the dj services he was providing. I highly recommend this vendor! Tony was professional; he provided great customer service and frequent communication. Tony was clear about prices and what would be provided, and he followed through with his commitments. Tony helpfully offered advisement regarding necessary rentals related to entertainment, as well as provided photos of other receptions at similar venues. We met prior to the reception and Tony helped to choreograph the day's timeline. He did a great job serving as MC, and the guests enjoyed him, as did we.